When you trip and have no excuse because you're not even wearing heels. 1. When the soles of your shoes are basically banana peels causing you to slip and fall uncontrollably in public. I don't know how they get so slide-y, but the whole reason I was wearing flats to begin with is so I wouldn't constantly fear death while wearing them and now that's shot to hell. 2. When you get blisters on the back of your heels. So then you just become this woman with Band-Aids on the backs of her heels, which totally come off as soon as you put them on so you can easily go through a box in a day. Cool shoes. 3. When you get those weird little cuts below your toes because the tops of your flats are somehow rubbing up against them. And you can't even put a Band-Aid here because it's so awkwardly placed. One time I tried to put a piece of paper there and it did not work out, but what else was I to do?! 4. When flats have that inexplicable bunched elastic at the back that rubs against your ankles like a jerk. Basically, wearing flats is just having your whole foot bleed a bunch. I see that now. 5. When they kind of quickly start to smell like death. 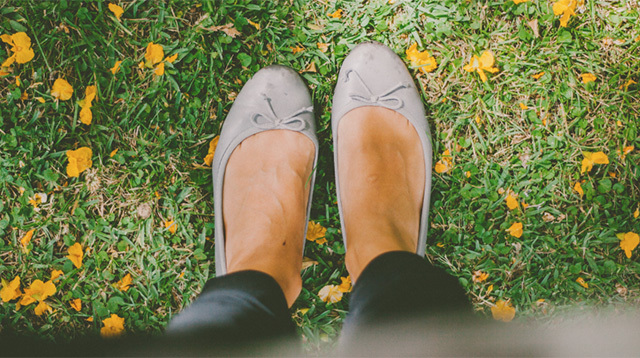 â€‹One of the best parts about flats is you don't need socks to wear them, but that also means they smell like a trash can in approximately six weeks of regular wear. 6. When you have to get them resoled every other month because you walk too much. Or if you bought a really cheap pair, you take them in to get resoled and they basically laugh at you until you walk out because they know they're made of the equivalent of plastic bags, and you can't resole a plastic bag. 7. When you trip and have no excuse because you're not even wearing heels. So I was wearing flats and there was nothing in the road and somehow I tripped anyway? Rude. 8. When you feel like a short, lazy weirdo in a heel-wearing crowd. And you have to just keep telling yourself, "Well, at least I'm comfortable," over and over again, even though your feet are ~*covered in Band-Aids*~ and that's a lie. 9. Arch support? What arch support? Why are most flats literally flat when our feet are not? Is anyone even paying attention when making these things? No? So I really have to go buy arch support inserts for all my shoes? Wahhh, but I am laaaaazy. 10. When your favorite pair of flats wears out and they don't make it anymore. When am I going to learn that if a pair of shoes becomes my default pair, I should clearly buy 20 so I can have them with me for the duration of my life?! When? !